Untermyer Park and Gardens opens at 7am, and closes 45 ​minutes before sunset every day. Except during the Grand Holiday Illumination from 12/12/18 until 1/1/19 when the Walled Garden is open until 8pm. During the Illumination, the remainder of the garden closes 45 minutes before sunset - visitors wanting to see the Illumination after sunset should plan on entering the garden from the North Broadway entrance - the gate to the aqueduct and the gate at the top of the Vista will be locked. There is no entry fee for the gardens. There is no entry fee for the gardens; however, self-guided group tours (15 or more people) must be scheduled in advance by contacting Jennie Bernard at jbernard@untermyergardens.org. A donation of $4 per person will be expected when arriving. ​Please visit our guided tours page for information on garden tours. Professional Photography: information on permits may be found on the Yonkers Parks Department Website or by calling (914) 377-6450. After making arrangements to book a time for your permit, you will pick up your permit at the Yonkers Parks Department at 285 Nepperhan Ave, Yonkers, NY. Only the City of Yonkers can issue permits for this site. Commercial Photography and Film: Please visit our Commercial Photography and Film page for more information. Weddings: Please visit our Weddings page for more information. The gardens are closed on major holidays from December until the end of March: Christmas (The Walled Garden opens at 4:30pm), New Year's Day (The Walled Garden opens at 4:30pm), Martin Luther King, Jr. Day, Washington's Birthday and Lincoln's Birthday. The Walled Garden is open on major holidays from April until December. The gardens will close early for private events on the following days in 2019: June 19 the Walled Garden from 3 PM, July 19 the entire gardens from 4PM and the Walled Garden September 22 from 3PM. There are two small lots with spaces for about thirty cars next to the community center at Untermyer. In addition, there is street parking along North Broadway which is both metered (coin operated) and unmetered. There are two designated parking spaces available next to the Cola Community Center. The path leading to the Walled Garden, and the paths within the Walled Garden are flat and covered with stone dust. The restrooms are multiuser and both have one handicapped stall. There is a small step up to enter the restrooms. We invite you to enjoy a half hour of recorded music daily in the Walled Garden at 10:30am and 4:00pm. Dogs are not allowed in Untermyer Park and Gardens. Download our Brochure and Map. An alternate walking route to the gardens uses the Old Croton Aqueduct trail. Follow the above directions and walk up Odell on the left side of the street until just before it makes a sharp right hand turn. The Old Croton Aqueduct trail crosses Odell at this point. Turn right, crossing Odell and entering the OCA trail heading south. There is an entry point to Untermyer on the Old Croton Aqueduct trail. You will notice large stone gateposts on the east/left side of the trail and a heavy relief sculpture of a lion and a horse. Go through the gate and you have two options: one, turn right onto the old carriage trail. The unpaved carriage trail winds upward through the estate to the gardens and can be navigated on foot. Two, go up the stairs and around the ruined Gate House, up the path through the woods, up more stairs to the former Rose and Dahlia Gardens, which lead to the bottom of the Vista. The 1 train terminus at 242nd street is only a few feet from the Westchester Bee Line terminus which picks up northbound passengers on the northbound side of Broadway. You can use your NYC Metrocard on the Westchester Bee Line. Take the 2 bus to Dehaven Drive. The gardens are across the street on Broadway at 945 North Broadway. Train & Bus: To avoid the uphill walk from the Greystone Train station and to shorten time spent on the bus, take the Metro-North Hudson River Line to Yonkers Train Station and catch the number 6 Bee Line bus in front of the station; get off the bus at Tudor Woods/Gateway Ave, walk up Gateway Ave and then head north on North Broadway to 945 North Broadway. Or catch a taxi to the gardens in front of the station. Hiking or Cross-country skiing: There is an entry point to Untermyer on the Old Croton Aqueduct trail south of its intersection with Odell Avenue. You will notice large stone gateposts on the east side of the trail and a heavy relief sculpture of a lion and a headless horse. Go through the gate and you have two options: one, turn right onto the old carriage trail. 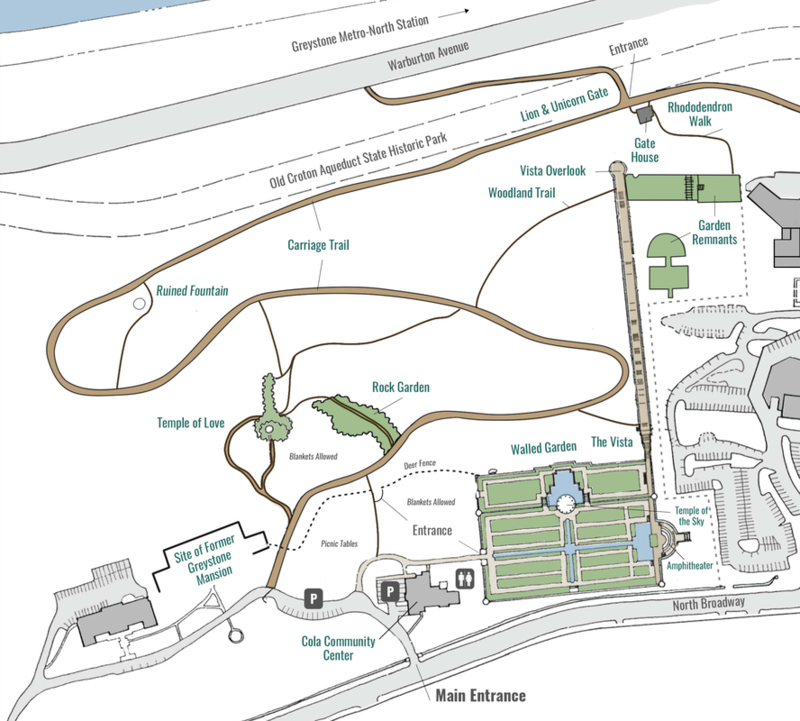 The unpaved carriage trail winds upward through the estate to the gardens and can be navigated on bicycle or on foot. Two, go up the stairs and around the ruined Gate House, up the path through the woods, up more stairs to the former Rose and Dahlia Gardens, which lead to the bottom of the Vista. Please use the Google Map below for driving directions. The main entrance is located at 945 North Broadway in Yonkers, just south of St. John’s Hospital. From the Saw Mill Parkway, take Exit 9/Executive Blvd., and go up the hill to North Broadway. Turn left on North Broadway, then go 1/2 mile and turn right at entrance to gardens. There is a small parking lot. When the lot is full, there is street parking.